I. What is a Simile? 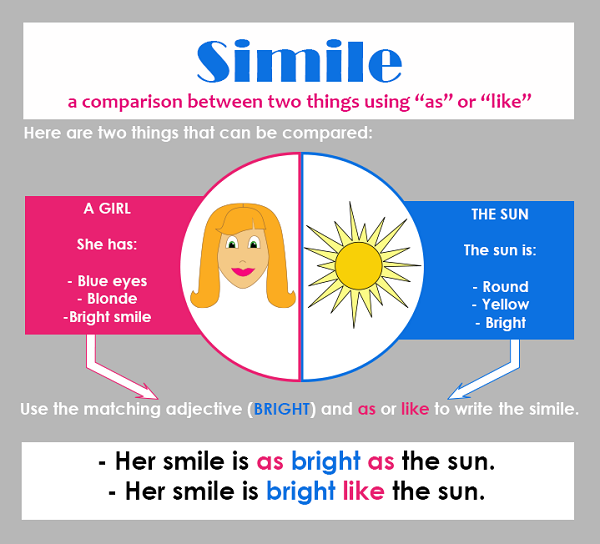 Simile (pronounced sim–uh-lee) is a literary term where you use “like” or “as” to compare two different things and show a common quality between them. A simile is different from a simple comparison in that it usually compares two unrelated things. For example, “She looks like you” is a comparison but not a simile. On the other hand, “She smiles like the sun” is a simile, as it compares a woman with something of a different kind- the sun. Similes find, or perhaps create, similarities in typically different things. In fact, there may be no real similarity between the things compared, such a woman and the sun. The image below describes a girl’s smile. Using the sun to describe a girl’s smile gives you an idea of how bright her smile seems, you can just picture its radiance. He’s as thin as a rail! There can be no real similarity between a man and a rail. But, describing a man as “as thin as a rail” evokes the image of a remarkably thin man, as a rail is a very thin pole. She moved like a deer. In this case, the comparison is much closer; a deer and a person are at least both living creatures. But they are still different enough for it to be a simile. After all, if she literally moved just like a deer, she might be graceful, but we would also worry about her sanity. The simile is still figurative, because we’re just saying that she moves with some of the qualities of a deer, not just like one! Similes are an important tool that make language more creative, descriptive, and entertaining. The mind thinks in images and associations, so similes are used to make stronger and more effective descriptions than if only adjectives or literal descriptions were used; they can stir up associated emotions, create new connections in the mind, and emphasize certain characteristics. Similes are almost essential to creative expression from everyday speech to poetry. Similes give the reader a more vivid experience of the story, calling powerful images to mind. He sat as still as a mouse, in the futile hope that whoever it was might go away after a single attempt. But no, the knocking was repeated. The worst thing of all would be to delay. His heart was thumping like a drum, but his face, from long habit, was probably expressionless. Rossetti uses simile three times in this section of the poem: her heart is “like a singing bird,” “like an apple-tree,” and “like a rainbow shell.” Rossetti compares the heart to a joyful bird in a full nest, an apple tree full of fruit, and a beautiful shell in a peaceful sea in order to poetically describe its joy, fullness, and peacefulness. Similes are just as prevalent in pop culture as they are in art, from movies and television to song. 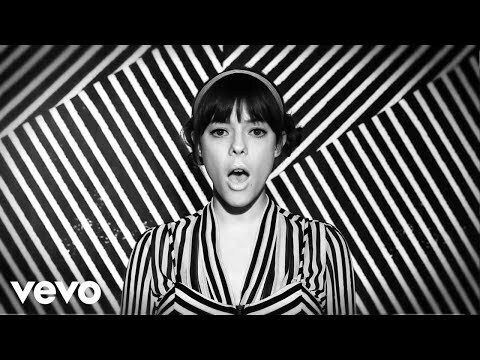 This video uses Lenka’s song “Everything at Once” which is full of similes. Lenka describes many character traits that she wishes to have, including shyness, strength, quickness, and bravery, by using animals or objects that symbolize those traits. I don’t mean to brag, I don’t mean to boast, but we like hot butter on the breakfast toast. 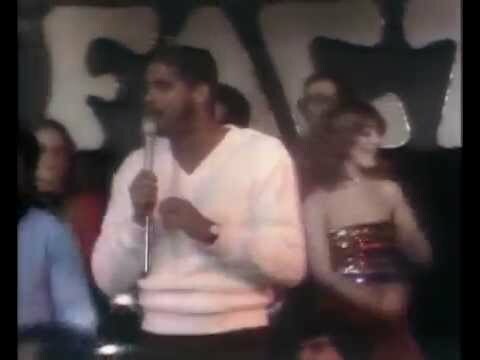 This example is an excerpt from Sugarhill Gang’s song “Rappers Delight.” Comparing themselves to hot butter on toast is a way of saying just how ‘hot,’ or popular, the group is. This example is from Outkast’s hit song “Hey Ya!” Comparing the body to a Polaroid picture encourages the audience to get up, dance, and shake the same way people used to shake a polaroid picture to dry it out more quickly. He’s as hungry as a wolf. As you can see, both metaphors and similes make the same kinds of vivid comparisons, just in different words. Which one you use may just depend on what kind of wording sounds or feels best in context. Similes are a powerful and creative form of description that uses comparison to evoke images or symbols of whatever you are trying to describe. The simile can make a woman’s smile beautiful by comparing it to a rose, or it can make her sly by comparing her to a fox. Similes use comparison to create connections between very different things, creating strong feelings and images.